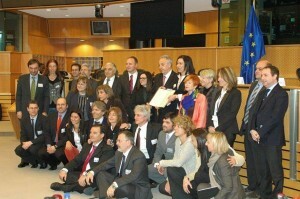 On 21st March 2013, several IMC member regions, partners from the MAREMED project gathered during the project final meeting, a high political level event at the European Parliament in Brussels, and signed the Bologna Charter 2012. Three years later, the Coordination Board – set up in 2014 under the CPMR Intermediterranean Commission Working Group on Integrated Maritime Policy – is meeting again in Rome on 28th April, after preparing the Joint Action Plan, drawn up as part of the project COASTGAP and presented in 2015 in Brussels at the MED Programme final Capitalisation event. This new meeting, which will be welcomed by Silvia Velo, Under-Secretary of State of the Italian Ministry for Environment, is organised to review the on-going initiatives in implementing the JAP with the BoCh network as well as to discuss new opportunities and collaboration for further implementations. It will imply looking at new EU programmes and funding and what’s going on in the Med area with regard to the macro-regional and sea basin strategies (e.g. EUSAIR and the emerging maritime strategy for the Western Mediterranean) and other initiatives (e.g. the Italian National Board on Coastal Erosion and the research Flagship Project Ritmare). The next day 29th April, the Italian Ministry for the Environment and Land and Sea Protection will be organising the event “Management of Coastal Erosion: national guidelines and first results”. In April 2015, the Italian Ministry launched the National Board on Coastal Erosion (TNEC) in collaboration with the Italian coastal Regions that are part of the Bologna Charter initiative network, the National Institute for Environmental Research and Protection (ISPRA) and the research and scientific community (CNR, Universities). Beyond its national mission, the TNEC aims also at extending this initiative in the Mediterranean with a view to collaboration. The intention is to act as a driver in the Med area and promote similar initiatives also through cooperation projects with other Med Countries. Intermediterranean Commission regions are invited to join both the Conference organised by the Ministry on the 29th of April and the Bologna Charter Coordination Board meeting on the 28th of April. Interested representatives should register online. Sustainable coastal management and protection – together with other maritime issues- will be also the focus of the next IMC General Assembly, which will take place in Venice on 30th June and 1st July 2016.